Topics: Acres Of Space, Arsenal, Travels, Thailand, and Cambodia. 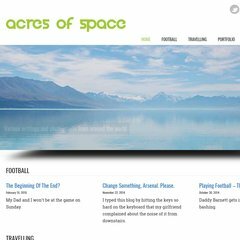 Acresofspace.co.uk's server IP number is 85.13.221.98. Its 2 nameservers are ns1.nsdesign4.net, and ns2.nsdesign4.net. It is hosted by Coreix Limited - Dedicated Server Ip Allocations (England, London,) using Apache web server. PING (85.13.221.98) 56(84) bytes of data.